Have you ever thought about how even the littlest thing can be wonderful? 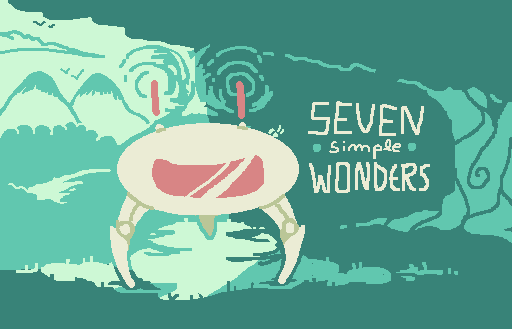 Seven Simple Wonders was submitted for the Sublime Bitsy Jam. This was my first time composing music! Sometimes when I am depressed I make myself go on a walk and I turn it into a scavenger hunt to find Five Things I Like. It usually ends up being flowers and bugs, or sometimes little quirky objects that seem to tell a human story. This reminds me of that experience and I hope it encourages others to go on such walks. This is so beautiful! I welled up a little. IDM grabbed the file for downloading via my browser but it appears to be an mp3 file. seems to download ok through the itch desktop app. This game is beautiful, I love how you took poetry and make it interactive with a beautiful and minimalist pixel art with a lovely and relaxing background music. Tiny and wonderful, really makes you stop and think. I love this! It's like a cute poem in videogame form. This game is so heartwarming, and all the analyses of the earth items are a sweet twist on the mundane - they really do feel more wonderful this way! This is so cuuuute!!!!! I love the framing you did!! That was a nice little trip to the land of everyday wonders! :) Especially the comments about the apple and the flower have made me smile, because I never had these thoughts in this particular form. <3 A wonderful little game that I liked to recommend in our compilation article about this edition of the Bitsy Jam series. :) One minute of the gameplay can also be seen in the accompanying video. Keep it up, that was wonderful and cute! Thanks a lot! I'm glad you noticed the rooms themselves, I spent extra time making them unique. Did you know that if you connect them all it forms a single, coherent map? This was really sweet. Thanks for making it. this is really beautiful. the music is so calming, great job!